Join us at the Gloria J. 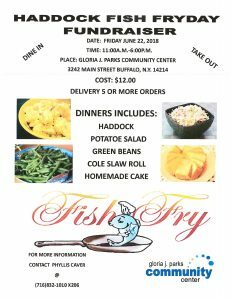 Parks Community Center on Friday, June 22, 2018 for the “Haddock Fish Fryday Fundraiser” from 11:00am-6:00pm. Proceeds from the event will support our growing Senior Program and help us add new opportunities to our weekly program lineup. We serve about 400 seniors each year and host a wide array of programs including computer, No Sew Throw, aerobic and exercise classes, social events, lunch, and so much more. Dinners include haddock fish and several side dishes, and are $12.00 each. You can eat in, dine out, and even place your order in advance. Contact Phyllis Caver for more information at 716-832-1010 ext. 206. Your support will help us continue to provide quality programming to our seniors!